It’s been a while, but things are getting back on track for “Wendy Markland: Chronicles Nocturnum”! We’re getting some book launch signings set up, and there are plans for something larger in the works this autumn! Anyone interested in securing ad space in the first issue of “Wendy Markland: Chronicles Nocturnum”, please contact project creator Scott Harper at Scott@scottharper.net. Some of my 30+ published short stories are on-line still and/or again. Here’s one called “Enemy Yours” for you to enjoy: http://authspot.com/short-stories/enemy-yours. Some of my 30+ published short stories are on-line still and/or again. Here’s one called “Doors, Doors, Doors” for you to enjoy: http://authspot.com/short-stories/doors-doors-doors. Any filmmakers out there—mega-budget, no-budget, Hollywood, or indie—interested in showing off a paperback copy of my award-winning, bestselling novel “Quintana Roo, Yucatan” in a movie? Calling All Comic Book Artists! Calling All Comic Book Artists!. Sorry for the lack of posts lately. Desirée had surgery a couple of days ago. As of yesterday, she’s home, and doing wonderfully. Anyone wishing to send her well wishes can do so easily from her website—www.desireelee.com. 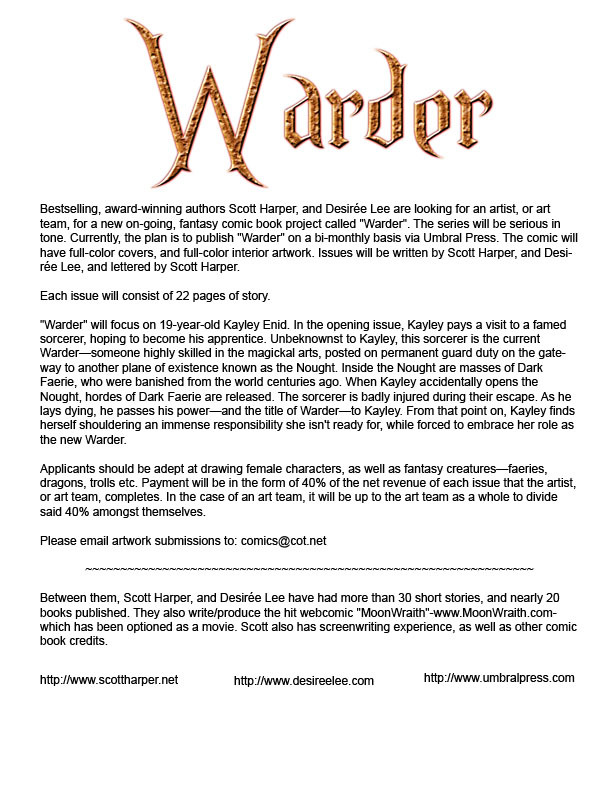 Desirée and I are still looking for an artist, or art team, for an on-going, bi-monthly comic book project. Please see the image in this post for details.